Global micro-LED display market expected to reach approximately USD 21,129 million by 2025, at a CAGR of slightly above 86.4% between 2019 and 2025. The rising demand for brighter and energy-efficient displays is anticipated to drive the micro-LED display market over forecast timeframe. The report covers a forecast and an analysis of the micro-LED display market on a global and regional level. The study provides historical data for 2016, 2017, and 2018 along with a forecast from 2019 to 2025 based on revenue (USD Million). The study includes drivers and restraints for the micro-LED display market along with the impact they have on the demand over the forecast period. Additionally, the report includes the study of opportunities available in the micro-LED display market on a global level. This report offers a comprehensive analysis of the global micro-LED display market along with market trends, drivers, and restraints. This report includes a detailed competitive scenario and product portfolio of the key vendors. To understand the competitive landscape in the market, an analysis of Porter’s Five Forces model for the market has also been included. The study encompasses a market attractiveness analysis, wherein all the segments are benchmarked based on their market size, growth rate, and general attractiveness. The global micro-LED display market is segmented on the basis of panel size, application, vertical, and region. Based on panel size, the micro-LED display market is majorly segmented into small [<10.5”], medium [10.5”–65”], and large [>65]. By application, the market is segmented into VR headsets, AR headsets, smartphone, smartwatches, tablet, TV, laptop, HUD, and digital signage. By vertical, the market includes automotive, consumer electronics, aerospace and defense, advertisement, and others. All the segments have been analyzed based on present and future trends and the market is estimated from 2019 to 2025. The regional segment includes North America, Europe, Asia Pacific, Latin America, and the Middle East and Africa. Each region has been further segmented into major countries, such as the U.S., Canada, Mexico, UK, France, Germany, China, India, Japan, South Korea, Brazil, Argentina, and GCC Countries. 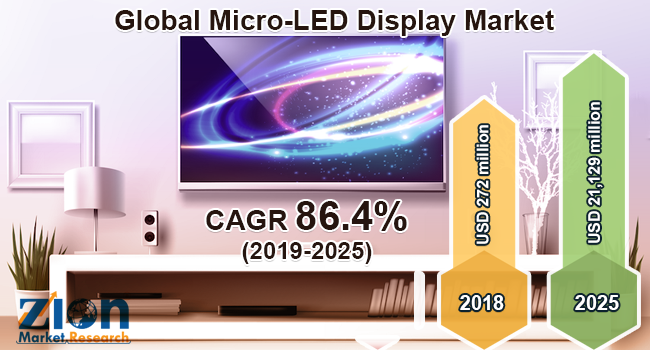 Some key participants operating in the global micro-LED display market are Samsung Electronics, Sharp Electronics, LG Display, Sony, AU Optronics, VerLASE Technologies, Lumiode, Apple, Inc., X-Celeprint, Rohinni, Oculus VR, Epistar, Lumens, Aledia, Cooledge Lighting, Nichia, JBD, Plessey Semiconductors, Ostendo Technologies, VueReal, ALLOS Semiconductors, Uniqarta, Mikro Mesa Technology, and PlayNitride, among others.